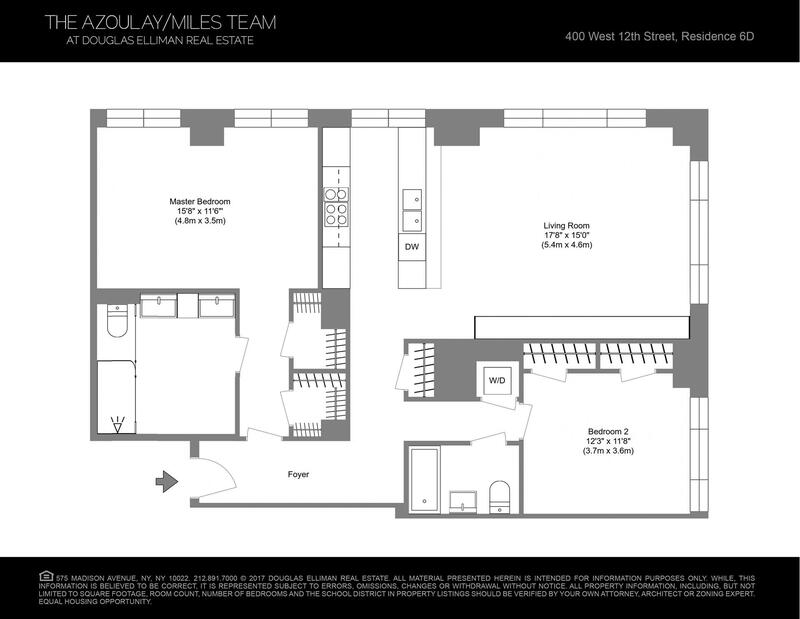 THIS UNIT COMBINES WELL WITH NEIGHBORING 6E TO MAKE A 2,175 SQFT (+/-) FOUR BEDROOM, FOUR BATHROOM CORNER RESIDENCE. Enjoy the wow factor of this exquisite corner split-2 bedroom, 2 bath West Village apartment at the Superior Ink Building along the Hudson Riverfront. Indulge in a luxurious lifestyle in a distinctive green, LEED-certified condominium tower by legendary Robert A.M. Stern and Yabu Pushelberg. Situated on quaint tree-lined, cobblestoned West 12th Street - one of the most coveted blocks downtown. The uniqueness and magnificence of this sophisticated sun-bathed home cannot be understated. The gracious floorplan is complemented by airy 10' ceilings, gorgeous views of the Hudson River, and divine western light that casts a lovely glow as the sun is setting. Thoughtful, meticulous touches like Morrado wood herringbone floors, cerused oak finishes and timeless oversized arched windows that blend perfectly with the history of the neighborhood. The corner living room is the focus of the residence, with a custom designed raised ceiling that is corniced to provide soft, subtle lighting and conceal drapery hardware. The ambience is further enhanced by custom built-in bookcases and a stunning chandelier. In the sleek open gourmet kitchen, white quartzite countertops and bleached Wenge cabinetry set an elegant tone, paired with built-in Sub-Zero and Viking Appliances that are ideal for the culinary enthusiast. A large breakfast bar provides additional seating in the living/dining space, a wonderful backdrop for entertaining. After a long day, nothing compares to the beautiful master suite with a spa-like bath clad in silver travertine slab and mosaic tiles. A oversized walk-in steam shower, separate water closet behind frosted glass, and elongated double sink vanity highlight this sumptuous retreat. The second bedroom is privately positioned at the opposite end of the apartment. Life at Superior Ink also means enjoying impressive 5-star amenities like a 24-hour doorman and concierge; new gym designed by Equinox with pilates/yoga studio; resident's lounge with catering kitchen; children's play room; bike storage; live-in Super and valet parking garage with direct elevator access. Located in the heart of the West Village, across from Hudson River Park, mere blocks from the High Line and Meatpacking District, this condo affords uncompromising luxury for those of discerning taste. Designer boutiques, trendy restaurants and sidewalk cafes and the new Whitney Museum are minutes from your door. Experience the highest standards of quality craftsmanship and design firsthand with a private tour.